The Spanish civil war was a call to arms for 2,300 British volunteers, of which over 500 were from Scotland. The first book of its kind, Homage To Caledonia examines Scotland’s role in the conflict, detailing exactly why Scottish involvement was so profound. The book moves chronologically through events and places, firstly surveying the landscape in contemporary Scotland before describing volunteers’ journeys to Spain, and then tracing their every involvement from arrival to homecoming (or not). There is also an account of the non-combative role, from fundraising for Spain and medical aid, to political manoeuvrings within the volatile Scottish left. Using a wealth of previously-unpublished letters sent back from the front as well as other archival items, Daniel Gray is able to tell little-known stories of courage in conflict, and to call into question accepted versions of events such as the ‘murder’ of Bob Smillie, or the heroism of ‘The Scots Scarlet Pimpernel’. 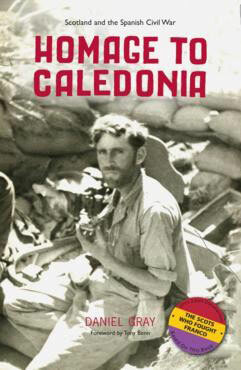 Homage To Caledonia offers a very human take on events in Spain: for every tale of abject distress in a time of war, there is a tale of a Scottish volunteer urinating in his general’s boots, knocking back a dram with Errol Flynn or appalling Spanish comrades with his pipe playing. For the first time, read the fascinating story of Caledonia’s role in this seminal conflict. Daniel Gray graduated with a politics and history degree from Newcastle University where he focussed in particular on foreign intervention in the Spanish civil war. Daniel has researched Scotland’s role in the Spanish Civil War since 2006, and lectured throughout Scotland on the topic. He has also written on the topic for Discover magazine and the Scotsman. He is currently employed as an archivist in the National Library of Scotland, working on 19th century literary manuscripts contained within the John Murray Archive, and lives in Edinburgh.